As posted by EMC News, December 7, 2012. EMC Events - A French soldier, Francis Lombard, settled in the area in the 1820s, or so the story goes, opened an Inn, and then, many things happened! A series of mills were located in Lombardy, drawing power from Otter Creek, shops, including the tradesmen's shops were established, hotels and taverns, eventually a cheese factory and a post office all of which served travelers passing through the region. The village of Lombardy also served as the seat of government for South Elmsley. Although Lombardy declined as a commercial centre in the 20th century, with its three churches it continues to serve as a social centre for the ward: United Church, the Roman Catholic Church and the Anglican Church. Holy Trinity Anglican Church, formerly known as “The Church of the Trinity”, was established in 1862 amidst the hustle and bustle of this thriving community. Over the past 150 years, regardless of its name, Holy Trinity Anglican Church has helped one another, their neighbour, the community, those outside the community and thousands around the world. It is because of this the current congregation celebrates the work of God in their midst. Being witness to God’s loving providence, the congregation will hold a Eucharistic service on Sunday, Dec. 9, 2012, at 10 a.m. We are hopeful that former parishioners will be able to attend this special occasion so that previous acquaintances will be rekindled, stories shared, laughs and good times recalled. As the congregation prepares for this celebration, we ask readers if they have stories of the church’s history to share them with us. All would be welcomed and can be sent to Holy Trinity Anglican Church P.O. Box 69 Portland ON K0G 1V0 or to Rev. Valerie Kelly at vkelly@ontario.anglican.ca. Perhaps you were/are involved in outreach programs such as the Tri-Church Pancake Dinner, or the monthly Good Food Box program. Many have taken part in the Relay for Life walk, perhaps the Primate’s World Relief & Development Fund walk-a-thon held annually for the past 27 years. 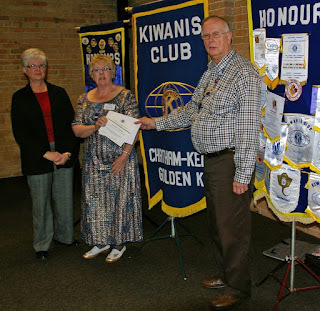 Maybe you donate to “Undie Sunday” where all donations go to the Brockville shelter and the Women’s Shelter of Ottawa. Whether you have been walking, handling food, buying undies, financially supporting a child through the Sleeping Children Around the World or the “Shoebox” program your efforts do not go unnoticed. The congregation of Holy Trinity would be delighted to know of your involvement. I hear often, I have contributed in the past but I just can’t do it anymore. I don’t have the energy, I must be getting old! One thing I remind these parishioners is they can still pray for others in need and the ministry and outreach of the church. So whether your contribution to the life and ministry of the church was “in front” of or “behind” the scenes, it has all and continues to matter. God has been very generous to the parishioners of Holy Trinity Anglican Church and they in turn have shown God’s love in their community. And for that on Sunday, Dec. 9, we give thanks to God. As posted in the Collingwood Enterprise Bulletin, December 5, 2012. COLLINGWOOD – Students at a local high school are off to see the wizard. 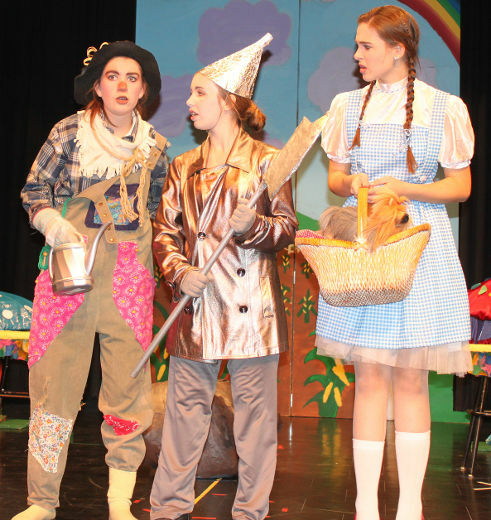 The Grade 11 drama class at Jean Vanier Catholic School will be performing “Someplace Wonderful”, an adaptation of the Wizard of Oz, from Dec. 6 until Jan. 11. The students sing, dance, act and they even manage an offstage role throughout the production. Sinopoli said the students began working behind the scenes on the production at the beginning of the school year and started learning their lines just over a month ago. “With only three months to put on a performance you’ve got to work quickly,” he said. “Someplace Wonderful” tells the same story of Dorothy, who follows the yellow brick road to find the wizard to help her get back to Kansas, but the production has been abridged to be performed in an hour. Another adjustment is changing roles to fit the gender. There’s only one male in the cast of 22 students, which meant changing some characters such as the Tin Man to the Tin Woman. Teacher and director Julie Morin says having the students perform onstage and offstage roles encourages them to be very involved. Some of the main roles are double-cast, such as Dorothy, which allows the students the opportunity to also do lighting or set changes. On Dec. 13 and Jan. 10 starting at 5:30 p.m., the school is hosting Charity Pasta Dinner Nights with all the proceeds going to L'arche Homes, Mamma Zapora Orphanage, and Sleeping Children Around the World. Tickets need to be reserved in advance by calling 705-445-2043 ext. 116 and asking for Mrs. Hadley. The performance will begin at 7 p.m. The Matinee shows in 2012 are Dec. 6 at 9:30 a.m.; Dec. 7 at 9:30 a.m.; Dec. 10 at 10:30 a.m.; Dec 12 at 10:30 a.m.; and Dec. 13 at 10:30 a.m. 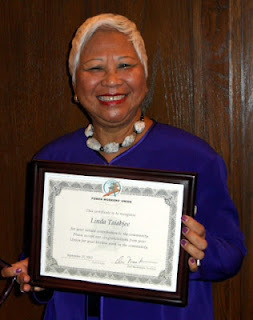 In 2013, the dates are Jan. 8, 10:30 a.m.; Jan. 9 at 2 p.m.; Jan. 10 at 10:30 a.m.; and Jan. 11 at 10:20 a.m.
"During the 75th Chief Stewards Convention of the Power Workers Union of Canada I received an Award for Volunteerism and Service to Community. "With this recognition was a cheque for a Thousand Dollars given to my Charity of my Choice which is of course, SLEEPING CHILDREN AROUND THE WORLD. "May all humanity love and accept each other. Picture above. Click to see a larger version. Submitted by Michael Crossling, SCAW volunteer. Click photo to see a larger version. Margaret received a souvenir certificate in recognition of her SCAW presentation of the Team Togo 2012 distribution earlier this year. Kiwanis Chatham Kent usually donate a SCAW bedkit in the names of each speaker to their club. After the presentation Margaret fielded many questions from interested Kiwanians as many members appreciated this update from someone who had been on a SCAW distribution. 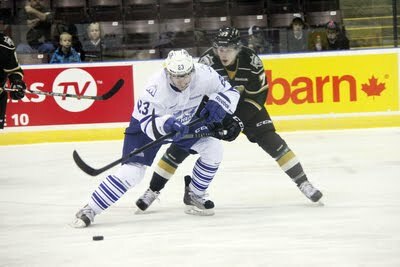 The Mississauga Steelheads and London Knights had their work cut out for them this afternoon at the Hershey Centre. After they couldn't determine a winner through regulation and overtime, they engaged in a 19-round shootout, the longest in Ontario Hockey League history. When the dust settled, the Knights prevailed 4-3 with a shootout winner from leading scorer Seth Griffith to extend their winning streak to 15 games. "I've never been part of a shootout that went that long before," said Riley Brace, a fifth-year forward who scored a goal and an assist in regulation for Mississauga. "Give London credit, their goalie (Kevin Bailie) made the big saves and he's good in those situations. "(The shootout) was pretty funny, but at the end of the day, we would've liked to come out of this with two points and snap their winning streak." Griffith, who sits second in OHL scoring with 50 points, also scored on London's first shootout attempt while Dylan Smoskowitz extended it past the minimum three rounds. Mississauga's Stuart Percy and Trevor Carrick and London's Matt Rupert and Josh Anderson also tallied in the shootout. The shootout broke the OHL's previous record of 14 rounds, set by the Windsor Spitfires and Saginaw Spirit in 2008. The world record belongs to the DEL's Straubing Tigers and EHC München, who needed a 21-round shootout to solve a winner in Germany two years ago. Smoskowitz and Josh Burnside scored late in the third period to help the Steelheads overcome a 3-1 deficit. Earlier in the third, Rupert and Chris Tierney scored 47 seconds apart. Max Domi opened the scoring for London in the first period. London earned the win despite being outshot 39-24 through regulation and overtime. It was their third game in as many days this weekend. "(Mississauga) came out hard, but we had a pretty good game going," said Knights coach Dale Hunter. "We jumped on them early in the third and they never gave up and battled back, but the end result was us winning in the shootout." Bailie finished with 36 saves while Spencer Martin turned aside 21 shots for the Steelheads. The Steelheads went 1-for-6 on the power-play while the Knights finished 1-for-3. With five minutes to go in the third, Smoskowitz re-directed a Carrick point shot after some strong forechecking forced a London turnover. Burnside tipped in a pass from Brace a minute later during a power-play to tie the game at three. Meanwhile, Brace's goal midway through the second period brought a barrage of teddy bears on the ice. Sunday was Mississauga's annual teddy bear toss game, where fans throw stuffed animals on the ice whenever the home team scores its first goal. The game is organized each year by Sleeping Children Around the World, an organization that will use proceeds from bear sales to build beds for children in underdeveloped countries and buy mosquito nets to protect children from malaria. All bears tossed on the ice were donated to the Boys and Girls Club of Peel Region. The loss was Mississauga's third straight, but Martin feels a four-game road trip beginning Friday against the Sudbury Wolves can help cure what ails them. "Home or away, we're going to keep moving in the right direction and work hard in practice," said Martin. "We've played some tough teams this weekend and showed a lot of promise in the last two periods against Niagara and the whole game today."